Having been deployed and tested for several months across multiple European countries, the HidnSeek tracker is now shipping to international customers. The tiny tracker is a highly-affordable device with customizable open apps which allow users to geolocate objects in real-time, to define parameters to track movement and boundaries, or to set alerts. Its applications include tracking or locating lost equipment, detecting possible accidents and motionless states, tracking drone paths or landing sites, or securing property by detecting unauthorized movement. The tracker uses the rapidly expanding Internet-of-Things network by SIGFOX, and is certified SIGFOX Ready™. The accompanying HidnSeek apps are available in the Google Play and Apple App Stores, and the company offers full web-tracking services that can be tailored for business customers’ websites. Robust and rugged, featuring long battery life and widespread coverage, the HidnSeek tracker offers customizable alerts, geo-fencing, motion detection, and more features which will soon be unlocked in the apps and website. Feedback from app users is very positive, highlighting HidnSeek’s for being ease of use without inserting a SIM card, its low connectivity cost, its open source and the company’s responsiveness to API questions. “The general feedback is that this is an all-round great ready-to-use solution for knowing where things are,” says Torres-Tuset. 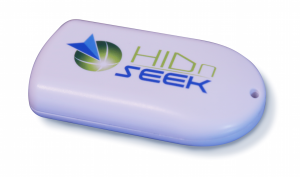 The HidnSeek tracker solution is available for worldwide delivery from the company’s website. The SIGFOX network, enabling rapid deployment of IoT devices, may be viewed here. HidnSeek, a connected asset management solution provider, is the first to deliver accurate affordable GPS tracking solutions to ensure valuable items never get lost. Based in Grenoble, France, HidnSeek was founded by Stéphane Driussi and Xavier Torres-Tuset. Thomas Landspurg has also joined the team, deploying HidnSeek smartphone applications. The company goal is to deliver more than just a tracker, by bundling revolutionary new functionalities together with ultra low-cost connectivity in an affordable and accurate GPS locator, using scalable UNB (Ultra Narrow Band) networks such as that of SIGFOX, which offer a disruptive solution for the rapid and affordable deployment of the Internet of Things (IoT).